2. A valid solution has a keygen and a tutorial! The crackme is not packed/protected, I decided to start looking at the disasm output. It’s obvious, first of all I have to understand what’s the content of the procedure at 0x4033A0 address is. The procedure’s code is really long but a trained eye understands immediately what’s behind everything. Why? Mainly because there’s a big switch, and there are a lot of snippets with common things like “esi+0C”, “esi+438”, “add ecx, value”. When I face this kind of algorithm I always start trying to verify if it’s an implementation of a Virtual Machine or not. I could be wrong but most of the time VM protections are easily identificable. To verify the correctness of my assumption is quite easy, a glance to the snippets used to implement VM instructions is enough. This is the first snippet I checked, it only adds one to the dword pointed by esi+0x438. That’s a nop, almost every VM has a nop instruction. The snippet is used to move a dword value inside a register. The instruction has two parameters, the register index and the value to move. As you can see it’s really easy to understand every single snippet with a possible VM implementation in mind. where you can clearly see part of the username (“Zai”), part of the right serial (“YiY”) and part of the fake serial (“123”). How does the crackme read a specific byte from the username, or the serial? 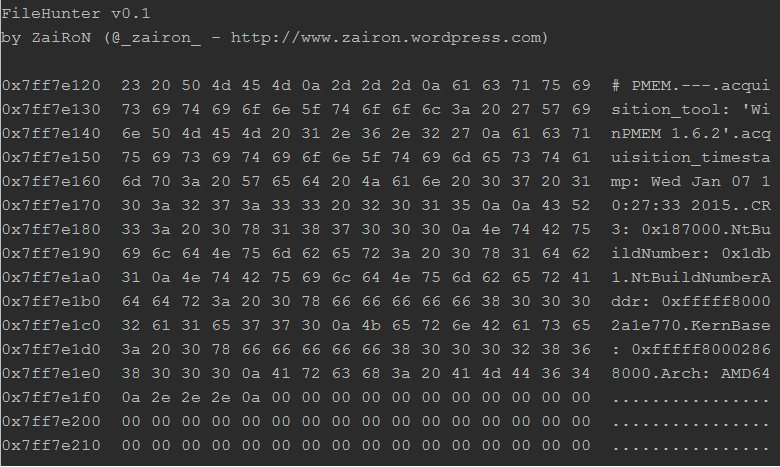 The memory is addressed by a dword at [esi+0x42c], each byte of the dword is used as an index position of a specific byte of the username/right serial/fake serial. Having said that, here is a description of the 0x62 VM opcode used to move a byte from memory buffer to a register. Every VM memory operation has the ability to increment the index memory pointer value, memory is read/write in sequential order. There’s a compare between two values, one from a register and the other from a dword value. The flag at [esi+8] is updated depending on the compare result. 4038D1 mov [esi+438h], ecx   <-- jump! I showed you few instructions but the VM instruction set is simple, there are basically almost all the instructions of an x86 instruction set: mov, cmp, conditional jump and direct jump. Parameters are stored using little-endian system. The VM doesn’t have call instructions, and so it doesn’t need a real stack implementation. The challenge deadline has arrived and a lot of writeups are coming out from various blog pages. The solutions of the first two parts are similar, but the last part has been solved approaching the problem in many ways. As far as I’ve seen the most common approach is guided by the Linux mount command, but I’ve seen the use of Autopsy, Foremost, X-Ways Forensics and The Sleuth Kit just to mention some tools. I don’t know many of them, and I don’t even know that my FileHunter program is quite similar to Foremost. 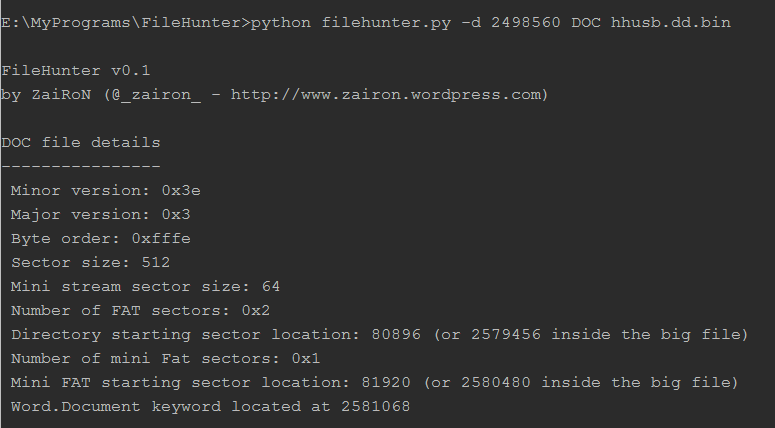 Anyway, FileHunter (FH in the rest of the post) is a Python program, and the aim is to search for file signatures inside a generic file (it could be an image, a raw dump, a doc file, everything). Here is the first thing to do, call the program passing the file to analyze as parameter. 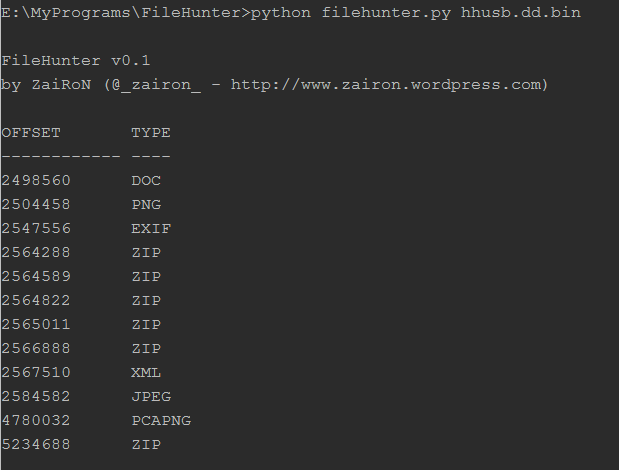 FH tries to understand all the possible file types contained inside the input file. With this simple invocation FH doesn’t check if one file is inside another one or not, it simply shows everything it’s able to recognize; the check is done over specific file signatures only. The offset is in decimal value. When I saw the output I felt quite happy because the tool can extract all the displayed types except the DOC (I’m still working it). 12 files revealed but just 7 saved as correct files (except the DOC file of course). Why? Two options: some files are included in the previous saved file(s) or there is one or more false positive. The answer is a combination of both options. So, seems like I have the necessary files except one. How can I extract the DOC? The DOC class is incomplete because the extraction feature is not yet implemented but, like all the other types, it’s possible to see some details about the header. File has been saved and I can view it with Word or OpenOffice or any other .doc viewer. With all the necessary files I was able to locate every single secret message. In the end, this is just an excerpt of FH. It’s based on Foremost principle but it has more features and I think it can be handy from time to time.